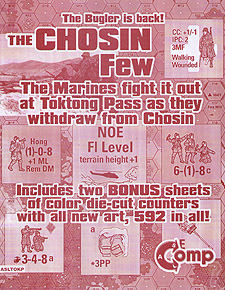 Toktong Pass II - The Chosin Few is a detailed ASLComp variant that tells the story of the Korean War from the perspective of the men of the 1st Marine Division, retreating from the Chosin Reservoir in the face of a massive onslaught by Chinese Communist troops. The Marines knew there was only one way out from Chosin, and that was to fight their way out, outnumbered and amidst some of the most hostile terrain on earth - harsh, hilly and frozen. The Marines could only bring their superior elan and small arms to bear against an enemy determined to annihilate every American soldier north of the 38th Parallel. Frostbite was an indiscriminate enemy while every hilltop captured by the Chinese had to be re-taken, every breach in the Marine perimeter repaired by force, without delay. NOTE: This is not a complete game. Ownership of Beyond Valor and Gung Ho is required to use this product.